Huzzah! I've spent large sums of our advertising budget to fund a brilliant idea: the GURPS Dungeon Fantasy Renaissance Faire! I also thought of an idea that both saves money and ties in our faire better with the product line. Instead of the usual actors and performers, all of our entertainers will be employed from the just-released GURPS Dungeon Fantasy Monsters 1. Pretty smart, eh? So, first, purchase your ticket from the exotic Demon of Old! Please, don't let the horns, claws, and barbed tail frighten you. I assure you the half-dozen protective chains means he's mostly harmless. No, don't sign the receipt. Don't sign th-- Never mind. Let's move on, shall we? Oh, the combat arena! How fun! Only, instead of folks in ill-fitting armor riding tired-looking horses, our arena features a gladiator ape! Notice the metal skullcap? The sharpened teeth? The spiked metal gloves? He's ready for real mock combat! This hour, we have scheduled a bout between our gladiator ape and a volunteer from the audience. Prepare to witness a true battle extraordinai-- Well, we now have 59 minutes, 54 seconds to kill before the next event. Let's see more of the faire. What's this? A humorous insulter -- played in our faire by a genuine watcher at the end of time! Doesn't he look whimsical, what with his mouthless face and the four sword-wielding arms? Hey, watcher! Cut that guy down with your rapier-sharp wit! No, use your wit! YOUR -- I might have foreseen that. We should stay out of the way of the bugbear cleanup crew. Hmm. The dinoman kissing booth seems closed. ("We're Full; Come Back Later"? Odd sign . . .) And I see the food pavilion is ablaze. I'm sure the flame lord and electric jelly had nothing to do with that. And based on the splatter pattern, I believe the obsidian jaguar has misunderstood the intent of the "snack booth." Things have gone very, very wrong here. Maybe I can blame all this on Sean Punch (Dungeon Fantasy mastermind) and Peter Dell'Orto (GURPS Dungeon Fantasy 12: Ninja). 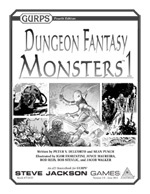 They were the ones who came up with GURPS Dungeon Fantasy Monsters 1 -- and its 30 deadly denizens -- in the first place. Oh, and the prefix system to make them even scarier. (Why settle for a regular eye of death when you can have an elemental eye of death?) The triple-digit body count all but assures a harshly worded memo within the next few days. Still, we'll deal with that another time. For now, we need to get to the exit -- which is presently guarded by a 35-foot ice wyrm. Don't offer it your hand to get stamped for re-entry; ask Lefty for details.